図７ Ogawa et al. PLoS One, 2014. 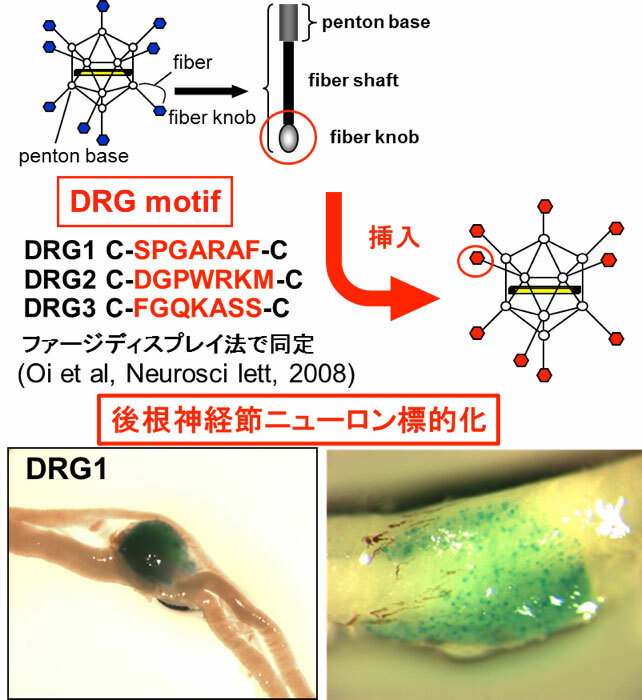 Oi J, Terashima T, Kojima H, Fujimiya M, Maeda K, Arai R, Chan L, Yasuda H, Kashiwagi A, Kimura H.
Isolation of specific peptides that home to dorsal root ganglion neurons in mice. Neuroscience Letters, 43: 266-72, 2008. 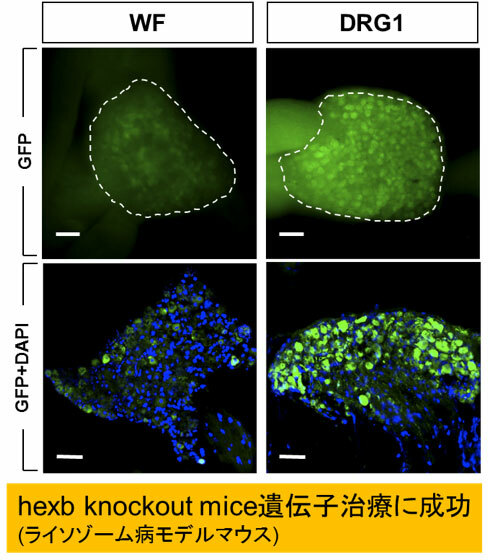 Terashima T, Oka K, Kritz AB, Kojima H, Baker AH, Chan L.
DRG-targeted helper-dependent adenoviruses mediate selective gene delivery for therapeutic rescue of sensory neuronopathies in mice. J. Clin. Invest., 119 (7) : 2100-2112, 2009. 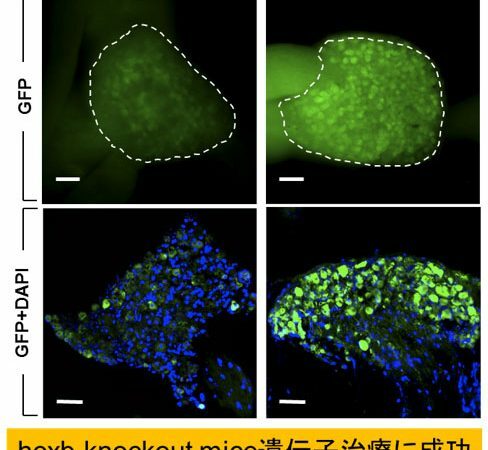 Ogawa N, Kawai H, Terashima T, Kojima H, Oka K, Chan L, Maegawa H.
Gene therapy for neuropathic pain by silencing of TNF-α expression with lentiviral vectors targeting the dorsal root ganglion in mice. PLoS One. 9: e92073, 2014. 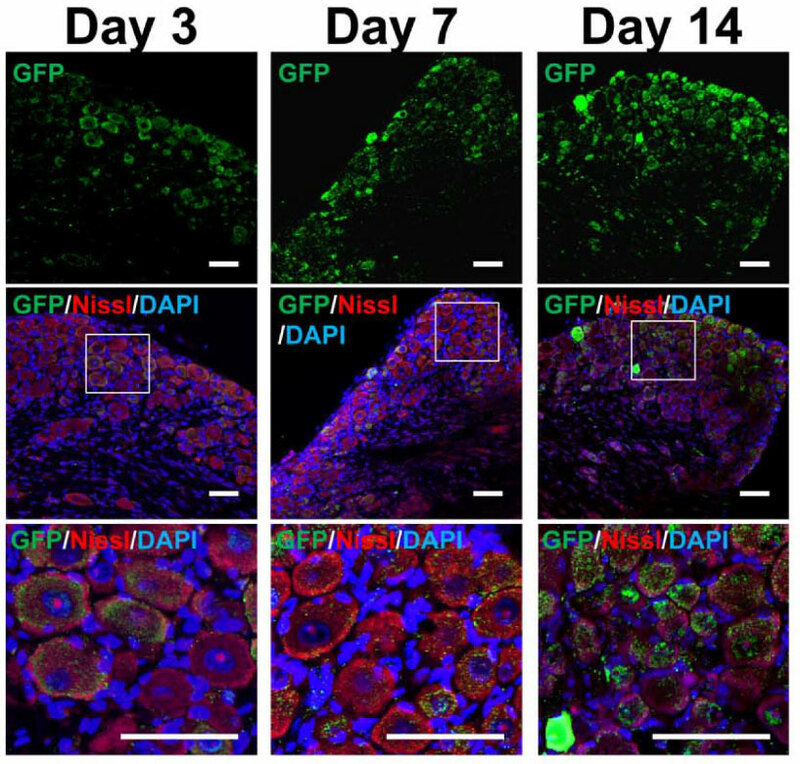 Terashima T, Ogawa N, Nakae Y, Sato T, Katagi M, Okano J, Maegawa H, Kojima H.
Gene Therapy for Neuropathic Pain through siRNA-IRF5 Gene Delivery with Homing Peptides to Microglia. Mol Ther Nucleic Acids., 11, 203-215, 2018. 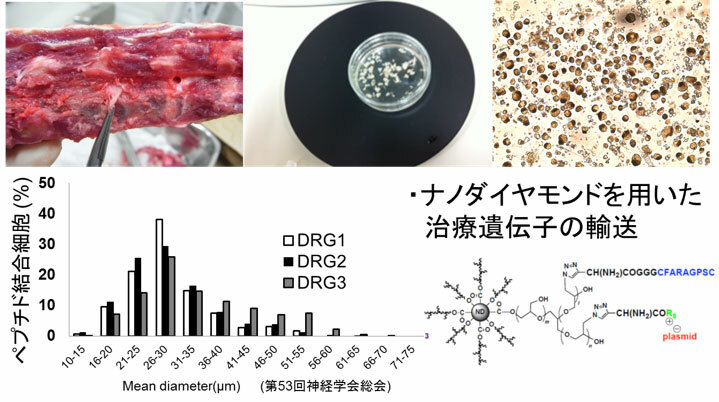 Ogawa N, Terashima T, Oka K, Chan L, Kojima H.
Gene therapy for neuropathic pain using dorsal root ganglion-targeted helper-dependent adenoviral vectors with GAD67 expression. PAIN Reports, 3, e695, 2018. Copyright © 2017 - 滋賀医科大学 生化学・分子生物学講座 再生修復医学部門 All Rights Reserved.